So I haven't made it out to the movies in a while (there hasn't been too much I couldn't wait to see), but if you have - there's a chance you might have seen this clip. 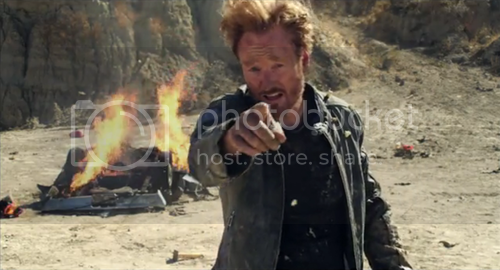 Conan O'Brien is back! This is his expensive, big-league movie trailer celebrating his return to television (now on TBS) that's airing before feature films this week. The over-the-top humor is classic Conan and so are the prop usage. The bottom line, as always, is expect the unexpected. lol, I like all the girls screaming in the weezer/mgmt thing. I love this stuff. Good selection. I'm complete distracted from whatever I was doing previously.